First general medical camp in Mangalore region benefited over 250 people. The medical camp was organised in collaboration with the Karnataka Medical College and the Yenepoya Dental College. Avashya Foundation’s Jeevan centre at Sion in the month of December’13 has supported over 102 patients. Visit of children from ACORN Foundation, to Flemish Paintings Exhibition in Mumbai. Avashya Foundation has organized medical camp at Koila, south Kanara District, Karnataka. Avashya Foundation collaborated with Sahachari Foundation for the cause of brining about women’s empowerment. In continuation to the environment conservation programme at Allcargo and the Avvashya Foundation yet environment awareness programmes on the 20th February 2013. Environment conservation and protection is part of the CSR charter at Allcargo and The Avvashya Foundation. Environmental sustainability is one of the focus areas of Avashya Foundation and it has been striving to preserve the depleting green zones of Mumbai. In keeping with this, Avashya foundation, in association with JAAG, an NGO deeply involved in education and healthcare needs of tribal in the forested areas of Mumbai, organised a tree plantation, solar lamp distribution and laying the foundation stones of toilets at Sanjay Gandhi National Park. Mrs. Arathi Shetty, Non Executive Director, Allcargo Logistics Limited along with eight employees of the organization visited the tribal villages of Sanjay Gandhi National Park recently, to distribute 500 saplings of fruit bearing trees, 250 solar lamps to enable children to study in the dark, and laying the foundation to construct 8 toilet blocks. This initiative will benefit 200 families from the villages, apart from preventing soil erosion due to plantation of trees and has also paved a way for additional income for the families. Career guidance is very essential for educational success of the students. It helps in moving on a right career path. Pre planned career guidance can make lot of difference in the life of the students. It plays vital role in planning future of the students, bringing clear sight of the goal, choosing right career option and prepares students for the contemporary competition. Lack of information about educational trends, lack of awareness about future prospects, lack of awareness about availability of the courses, parent’s pressure and sometimes lack of financial resources acts a stumbling block in choosing right career path. The educational situation is not favourable in slums areas wherein parents are less educated, and exposure is very limited. Keeping these multiple factors in mind, Avashya Foundation has organized career guidance programme in Govandi area of Mumbai. The career guidance programme was organized in collaboration SAAD Foundation and Gaondevi Education Foundation. Over 108 students from six different schools and colleges were present. Students could receive guidance from three expert resource persons on online admission procedures, goal setting and availability of the streams and prospects each of the stream offered. The students have participated in a game which helped students realize importance of planning, coordination, information, determination and being focused on the goal. We sincerely appreciate efforts taken up by Mr Chandrakant Sasane who coordinated with the students and the NGOs for making this event possible. He guided students and spoke on role of the parents in the educational advancement of the students, planning career, making right choices while choosing subjects/ streams, and importance of education in altering social and economic life of the families and society at large. Nilratan Shende also addressed the students and spoke on need of being disciplined in studies, turning adversities into opportunities (keeping in mind socio economic hardships of the family),setting a dream, meticulous planning in realizing desired dream. He also stated while addressing students “realizing desired higher dreams in your life would enable each one of you to emerge as a role model for other students in the vicinity and be a proud son or daughter”. Avashya Foundation organises medical camps in Karnataka for providing and addressing prevailing health needs of the local community. It has organized first medical camp for this financial year at Siddakatte, near Mangalore, Karnataka. Siddakatte is situated around 35 km away from the district head quarters. The medical camp which has experts from eight different specialization addressed health needs of the community in a holistic way. The medical camp was organised in collaboration with the Karnataka Medical College and the Yenepoya Dental College. The medical camp has received tremendous support from the local communities and services were availed for various health ailments. Number in the bracket indicates number beneficiaries availing particular services: Eye (105), Orthopedic (24), Dental (55), Skin (15), General Medicine (37), Gynecology (12), Pediatric (14) and ENT (19). Medical camp has screened 760 patients. Allcargo Logistics Ltd and Avashya Foundation have been working in Karnataka, Tamilnadu and Maharashtra in order to bring about inclusive development. Avashya Foundation has partnered with Foundation of His Sacred majesty (FHSM) to work on the health issues. FHSM has been working with deprived section of the society in ten districts of Tamilnadu. Avashya Foundation in coordination with Foundation of His Sacred Majesty (FHSM) organized five eye camps in Chennai. Eye camps were held at Chromepet, Ernavoor, Rajakodai, Nagura thottam and Ennore. Services were availed by quarry workers, people depending on leather and dyeing industries, people who are dependant on the sea for their survival, people belonging to angler community and migrants. They largely belong to below poverty line income groups and hence cannot afford treatment. glimpse of the program and its initiatives. Avashya Foundation, as part of its CSR initiative recently organized a visit of children from the ACORN foundation, to see the 17th century Flemish paintings exhibition at Chhatrapati Shivaji Maharaj Vastu Sangrahalaya (CSMVS) in Mumbai (Fort). The visit was held on Sunday (22nd December) wherein 40 children between the age group of 10 to 15 years participated, led by volunteers from Allcargo along with their families and representatives from ACORN foundation. ACORN foundation is a registered charitable trust currently working in Mumbai, Delhi and Bengaluru. ACORN (India) is affiliated with ACORN International, working in 12 countries around the world. One of the largest programs managed by them in India, is the ‘Dharavi Project’, which aims to support, educate and create livelihood for children who are rag-pickers and waste collectors across Mumbai. These are children across all age groups and from economically challenged sections of the society. They are provided with free education in terms of primary and secondary independent schooling, skills development training in term of IT education and most important of all change the living conditions of over 100,000 rag-pickers who are segregating waste in and around the landfills of Mumbai. 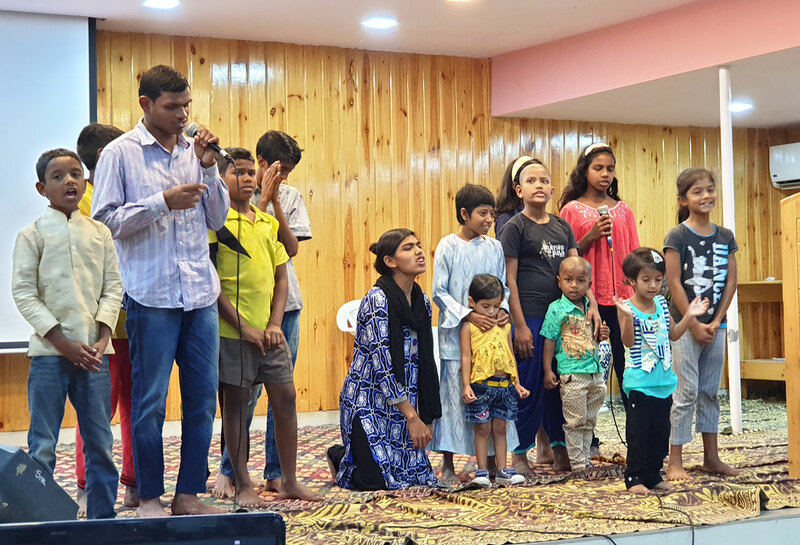 The project’s mission is to increase the welfare of economically challenged children and give their profession a legitimate and sustainable voice in the recycling and waste-management value chain at Dharavi. Its community centre in Dharavi (Mumbai) acts as an office, recycling centre, library and school for children. Avashya Foundation continues to support ACORN foundation especially their ‘Computer Literacy Program’ which was started by provision of laptops by Avashya Foundation. At present over 200 students are imparted training through this program. The visit of some of the children from ACORN foundation to CSMVS, was part of the education tour initiated by Avashya Foundation, to give the children a glimpse of world’s history and heritage, as well as create a memorable experience for them, of visiting India’s oldest as well the largest museum in Mumbai. The scholarship distribution event was organized at The Avvashya House, Mumbai. The event was presided over by Mrs Arathi Shetty, Non Executive Director. Mr Prabhakar Shetty and Mr Jatin Chokshi, Chief Investment Officer (CIO) have also graced the event. 154 deserving students including 78 boys and 76 girls were selected for scholarships. Selected students were from 90 different schools, colleges, institutions and universities. Scholarships were offered to the students from Standard I to Post Graduation. 31 students from I to X standard, 64 students from XI to XII standard, 47 and 3 students were pursuing graduation and post graduation respectively, 3 were into D Ed (Diploma in Education) and five were in polytechnic. We have supported some prospective engineers, CAs and Managers. Avashya Foundation has been organizing medical camps in Karnataka in order to provide and address prevailing health needs of the community in the region. It has organized fifth medical camp at Kalathur, near Mangalore, Karnataka. e medical camp has received tremendous support from the local communities and services were availed for various health problems. Number indicate beneficiaries availing particular services: Eye (377), Orthopedic (83), Dental (110), Skin (38), General Medicine (58), Gynecology (10), Pediatric (09) and ENT (32). Medical camp has screened 760 patients. Ophthalmic care is one of the important area however neglected due to some social, economical and infrastructural problems. It has been observed that due to affordability and accessibility people are not able to avail the health services. Both these factors impacts on the vision and sight and consequently leads to blindness and dependency on others. The camp was therefore planned in order to provide quality ophthalmic care to people and prevent blindness among people. Keeping these grass root realities in mind, Allcargo Logistics and Avvashya Foundation has organized eye check up camp at Koproli, Tah Uran and District Raigad in order to prevent blindness among people and improve vision and sight. 347 beneficiaries have availed the services of the eye check up camp. 43 persons were also identified with the cataract. Allcargo Logistics Ltd will also support cataract surgeries of all the patients. Similar camps will be carried out in and around the area JawaharlalNehruPort trust (JNPT) area. Employee engagement: Five staff (Pramod Desai, Sameer Mhatre (HR/ Admin), Nilesh Chikane (Accounts), Jitendra Bhoir, Prasad S (operations) from CFS have volunteered their time and contributed towards making camp a success. Avvashya Foundation has organized medical camp at Koila, south Kanara District, Karnataka. It was condcuted keeping in mind the health needs of the local communities. The medical camp screened 450 patients of which 58 persons were referred to other hospitals for further check up. The medicines were also dispensed to the patients. The specialty wise breakup of services availed by patients is indicated in the bracket. ENT (26), Orthopedics (53), Gynecology, (11), Pediatrician, (24), General (16), Eye (190), Skin (25), and dental (107). 117 persons have been identified for refractive errors and were provided with spectacles. 14 patients diagnosed with cataract and will be operated. The camp had services of the 17 Doctors, 12 dentists and staff. The medical camp was organized in collaboration with KasturbaMedicalCollege and YenopayaDentalCollege. In terms of strengthening its health intervention, the Avvashya Foundation has initiated MedicalSupportCenter at LTMGHospital, Sion with the objective of providing medicinal, investigational and operational support to the economically backward section of the society in order to help save life and to provide timely and quality medical assistance to economically backward section of the society. MedicalSupportCenter was inaugurated by Dr Suhasini Nagda, Director Medical Education and MajorHospitals and Mr Umesh Shetty, Executive Director, Allcargo Logistics at LTMG Hospital Sion on 18th of March 2013. Mr Umesh Shetty, Executive Director thanked Director and Dean for their active support. While speaking on the occasion he emphasized that MedicalSupportCenter would address the challenges of accessibility and affordability that people faces while availing health services and would extend benefits to the deprived and vulnerable section of the society. The Medical Support Center fully operational at LTMG Hospital from 28th of March 2013. It has supported an innovative project of cab by the women for the women. The initiative will not only provide safety to the women but also ensure sustainable livelihood in Delhi. The key of the cab was handed over by Mrs Aarti Shashikiran Shetty and Mrs Yashodhara Raje Scindia, Member of Parliament to Nayantara Janadhan of Sakha Cabs in the event held at Delhi. The scholarships are given with the objectives of reducing the economic hardships of the students and enabling them to pursue quality education, preventing the likelihood of the drop out of the students facing economic hardships and encouraging educational mainstreaming of the deprived students in order to pave way for their brighter future. The scholarship distribution event was organized at Bunts’ Sangha’s Institute at Kurla, Mumbai on 4th of March 2013. 15 deserving students were provided scholarships during the event. The event was presided over Mr Harish Hedge, Treasurer of Bunts Sangh, Dr K E Cheema, Principal, Bunts Sangha and Mr. Nilratan Shende, AGM CSR. The environment awareness campaign that was officially launched at the Kalina office had the 3rd and 4th session conducted at TransIndia and for the Repair and Maintenance dept, Nhava Sheva, JNPT. These sessions also created awareness about the environmental issues, sensitizing on energy conservation and encouraging voluntarism amongst the employees present. Awareness amongst employees: The session was attended by 32 employees at Trans India and 27 employees at Repair and maintenance which has sensitised participants on environmental issues. Voluntarism: 10 employees from Trans India and 26 employees from Repair and maintenance expressed their willingness to be part of the environment campaigns that take up larger issues of the environment conservation. Place: JNPT, Nhava Sheva, CFS. Mr Surendra of Greenpeace spoke at length on challenges that BT cotton and genetically modified seeds pose to the environment. He also spoke at length on the danger of introducing genetically modified seeds in India and adverse implication it can have on the agriculture sovereignty and health of the people in the country. Mr Surendra also introduced concept of the decentralised power as an alternative to the prevailing power crisis and environmental degradation. Allcargo Logistics participated in the 10th edition of the Mumbai Marathon 2013 held on the 20th January under the Corporate Challenge category. A contingent of 15 runners represented the company; of which 12 of them ran in the dream run category while 3 ventured in the half marathon (21 Kms). We are also aware that some of the employees have participated in the Mumbai Marathon 2013 in their individual capacity and therefore appreciate their efforts as well.